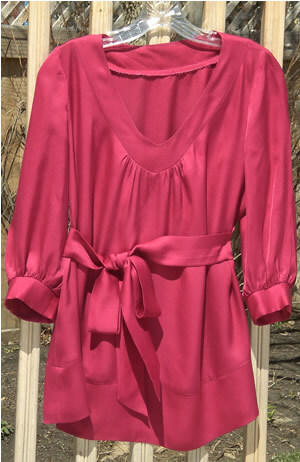 I saw a blouse like this at Nordstrom, it was around $200-$250 and I didn’t like the colors it came in, royal blue or kelly green. I couldn’t find a pattern to use to copy it, so I made my own. 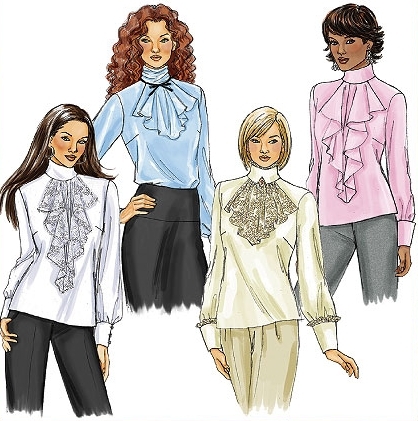 I started with Butterick 4658, I’ve used this pattern as the beginning of many blouses. 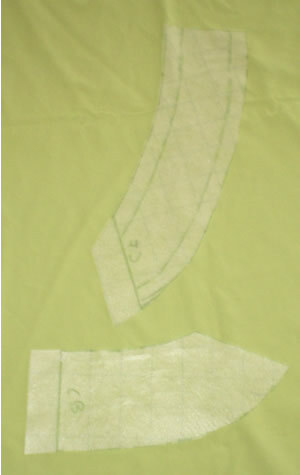 First, on the front pattern piece, I drew on a v-neckline. 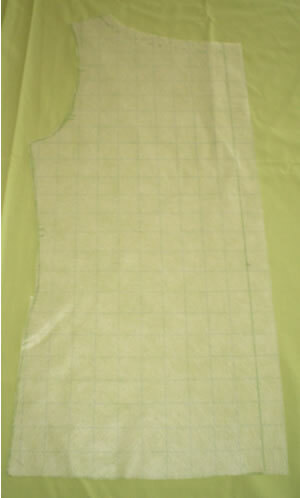 I measured how low I wanted the new neckline to be and drew a a straight line from the shoulder to the center front. Then I gave the v-neck a nice curve. 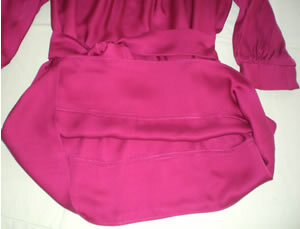 I had to shorten the back shoulder seam to match the new front shoulder seam and scoop out the back neckline too. 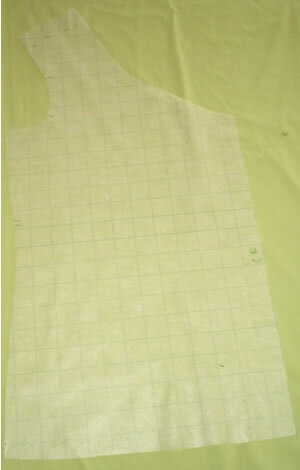 Then I cut 2″ front and back facings off of the front and back pattern pieces. 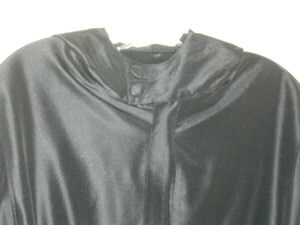 I added seam allowances to the facings and the front and back neckline. I slashed the front and added about 4″ of ease (1″ between each cut). 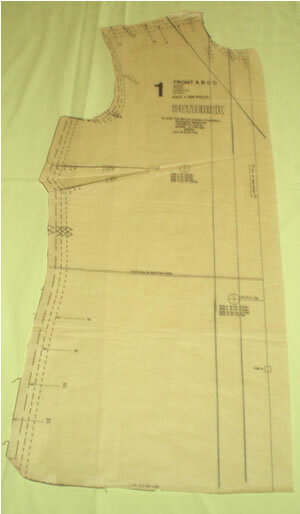 See photo above of front pattern piece. I drew 2 parallel lines 1″ apart and 1″ from center front and slashed and spread the pattern here. I wanted to keep the shirring close to the center front. I folded out the dart because I had plenty of ease with the new width I was adding. Then I arranged the slashed front pattern piece, with the spacing between the slashes and placed a piece of pattern material over it and traced the new front. 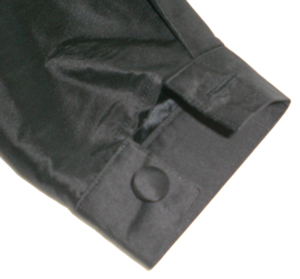 I shortened the sleeve 5 1/2″ to just below the elbow. I added a 2″ wide cuff, measuring my arm for the finished length. The construction went smoothly. As always (see my post on sewing with silks in “Tutorials”) I covered my cutting table with a sheet and pinned the pattern pieces to the fabric and the sheet. This keeps slippery fabric under control. 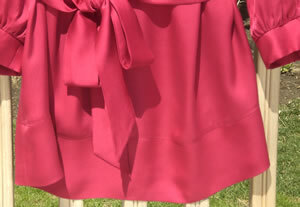 I finished the seams with pinking shears. I have a serger, but the thread showed through to the right side when I pressed the seams. 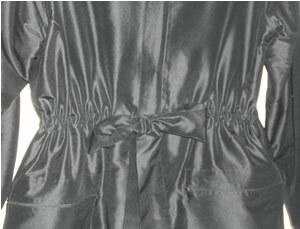 The best way to finish the seams would’ve been with french seams. I marvel at and appreciate all of you who finish you garments so beautifully on the inside. But I’d never get anything finished if I were that perfect. If I’m the only one who is going to see the inside, I finish in the fastest way possible. When I’m sewing for others I make it look good inside. I constructed the facings, understitched the neck edge and top stitched it. Then I sewed the fully constructed facing unit to the front and back, sewing with all of the raw edges together then pressing toward the garment. Turned out pretty good, if I do say so myself. 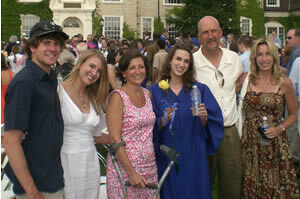 In this picture you can see my pinked seam allowance at the back neckline. I love this hem–I first saw it at Donna Karan and the Derek Lam skirt in my Spring ’08 Wardrobe Part 1 post (in Design Inspiration) uses it too. It’s basically a cuff added to the bottom of the blouse. 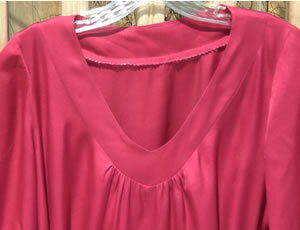 It eliminated the problem of narrow hemming the slippery silk fabric and it adds a little weight to the blouse and makes it hang nicely. 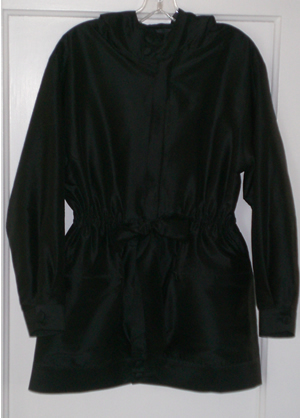 The blouse looks great over skinny jeans or black slacks. And it’s great for those “fat” days! 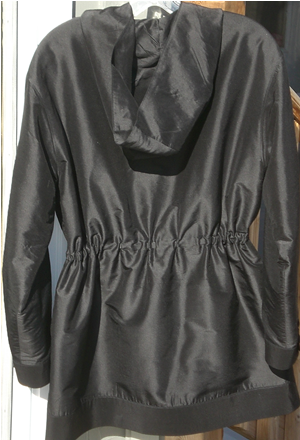 I used a black silk shantung I had in my stash. 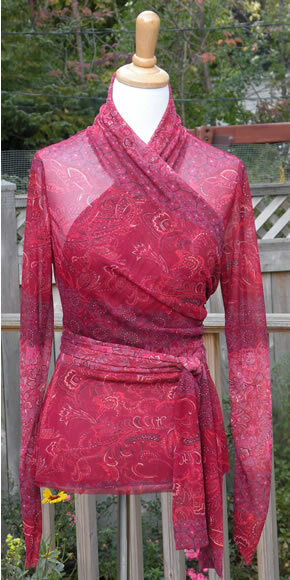 It was super easy to work with and has my favorite fabric quality, it presses beautifully with nice sharp creases. 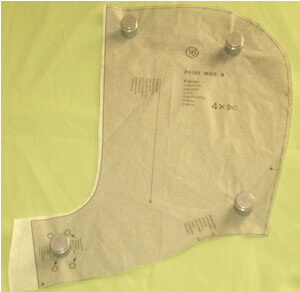 Neue Mode patterns don’t have seam allowances included 🙁 and I’m just too lazy to draw all those seamlines, so I added seam allowances only where I had to–around the hood opening, the center front, the armseye and sleeve head. 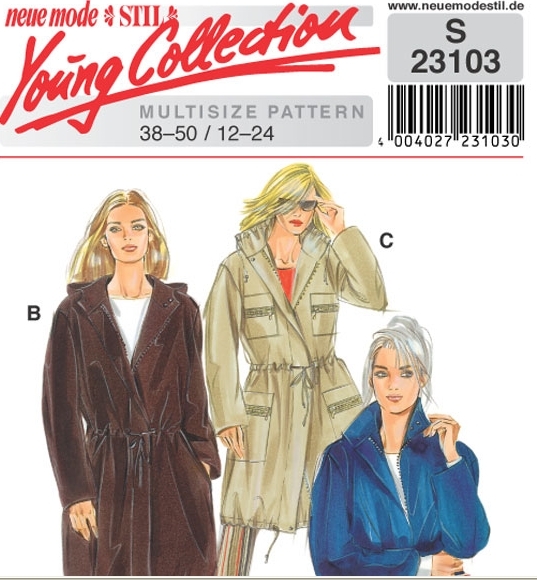 Then I used one size larger than normal. This worked out fine, in fact the pattern is so over-sized that I still had to take in the side seam allowances about 1 1/2″ on each side side (for a total of 6″!). 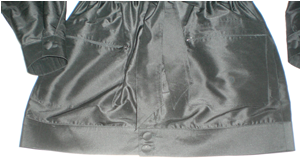 The pattern does not include lining, but I used the pattern pieces to cut a lining from a heavy satin. 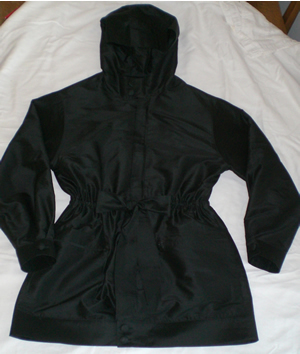 This gives the anorak a nice, hefty weight and it will be quite warm. 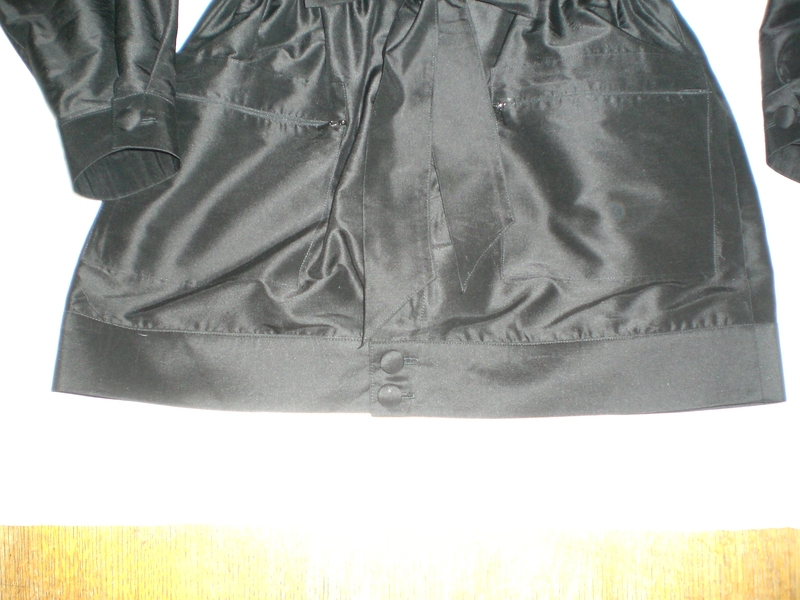 Because I lined the jacket, I formed the casing by stitching the lining to the silk. 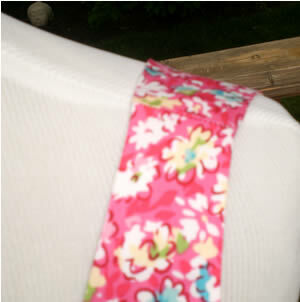 I used elastic and sewed a 2″ wide belt to the ends of the elastic. 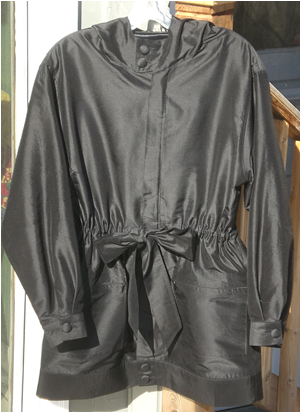 I used View A for length and added a 2″ band to the bottom to give the jacket a nice finishing at the hem. 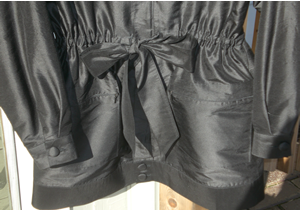 I used the pocket from View C, but instead of regular zippers, I used invisible zippers for a sleeker look. 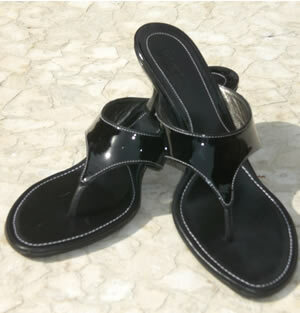 I wanted to use 3/4″ silver snaps, a la Prada, but I tried a sample and they just don’t work! I’ve never had luck with the snap kits available at the fabric store. Next time I’ll try to find a source online for commercial snaps. So I used covered buttons instead and I like the look, they go well with the dressy fabric. 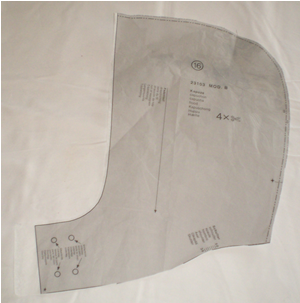 Here’s a picture of the hood pattern piece. 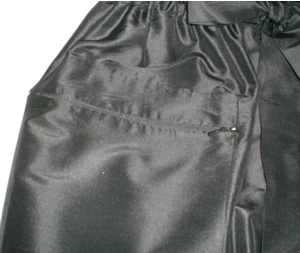 If you can see, I added a 1/4″ seam allowance around the front opening. I didn’t even draw it on, I just added it as I cut-out the pattern. 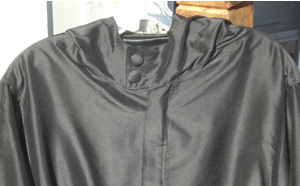 I also added an overlap for the buttons and button holes. I added plenty (around 3″) and trimmed it to fit as I was sewing. This works especially well on fabrics the press nicely. I just ordered a dressform so I can take better pictures of my creations. 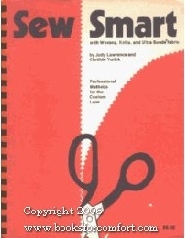 It’s about time I had one, I’ve been sewing for over 30 years!